Screenshots do not lie.. Amazing gaming experience through Augmented Reality. Walk around your room and hunt for insects - they will appear suddenly.. Perceive the environment you live in with frogs eyes! Download CRAZY FROG App and find yourself as a game hero and insects BUSTEEEEER! Be aware that it's not easy! Get ready to catch and swallow various type of insects! They are attacking you and trying to beat you.If you are not smart enough soon you'll face a troop of insects, because as you know their reproduction system works 100 times faster then humans! 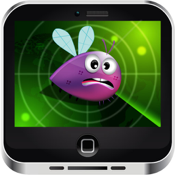 We've developed assistance additions for you: Radar - Which helps you to look for insects and sound effects to let you know when they getting closer! Looking forward to see your bright 5 stars!